We have had two near misses in South Africa. One reason we planned our trip in the order we did, was to see the amazing display of wild flowers that happens each spring: except this year it didn’t! 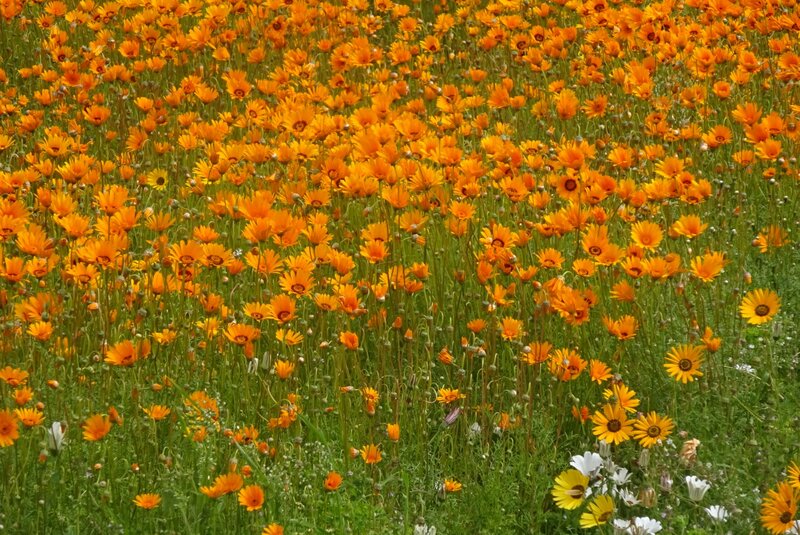 We went to Clanwilliam first in the hope of seeing this spectacle, but this third year of drought has meant the flowers haven’t really happened. Clanwilliam dam was at about 37% capacity, and the whole area around Cape Town and the Western Cape is suffering from drought. The town had cancelled its annual flower festival, and a lot of visitors were hunting the flowers in vain. So we will have to come back another year! The drought here is really serious. This is the third winter when there has been little rain, and after September, possibly October, there will be no chance of rain for the whole summer. There are notices around about saving water, and they are now at Level 5 restrictions, the highest, so there are strict limits on domestic water use. This is monitored by each property’s water meter, and there are fines for excessive use. People are using grey water for gardens, car washing, etc. However, the criticisms coming from South Africans we have spoken to are that there seems to be little forward planning. Droughts (like the Californian one) tend to go on for 5 to 8 years, so it isn’t somehing that will go away soon, but the impression is of just reacting to the current problems rather than looking for more far reaching solutions. And, as tourists, we feel we have been protected. Maybe people here fear that visitors will be unhappy about water restrictions, but surely as responsible tourists and citizens of the world we should all be helping conserve water as much as possible. We may not have seen the flowers, but other wildlife has been impressive. 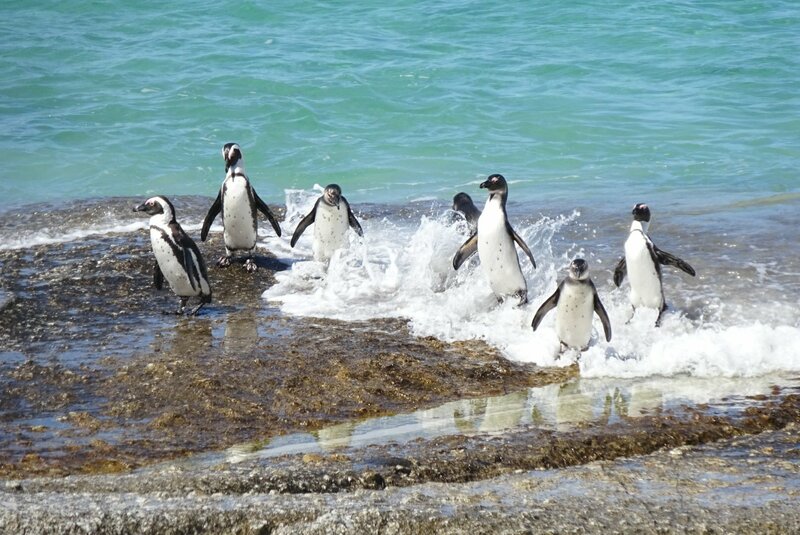 One highlight was the penguins at Boulders Beach near Cape Point. There are hundreds of them, on the beach, in the undergrowth, and in the sea. 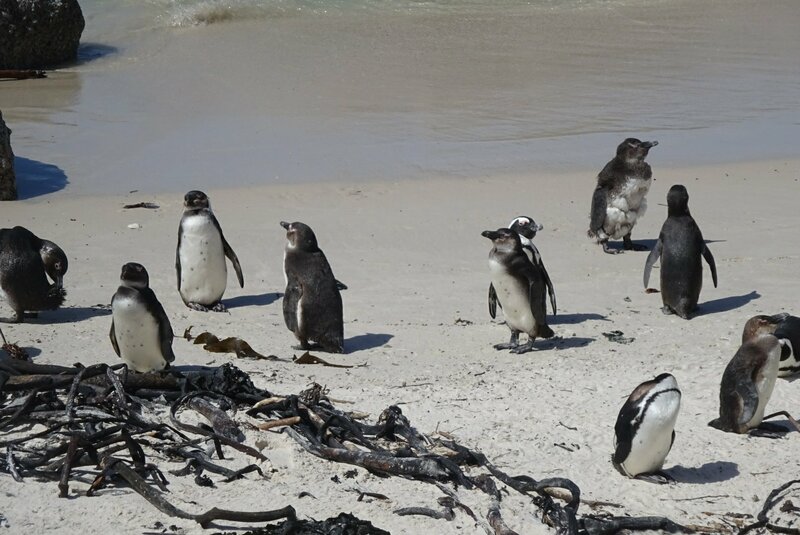 There were fluffy youngsters, as well as some poor bedraggled souls going through moulting (at which point they have to stay on land as they are no longer water-proofed). I loved seeing them dive into the sea, where they are transferred from cute but ungainly birds, into creatures in their element, swooping and “flying” at speed through the water. 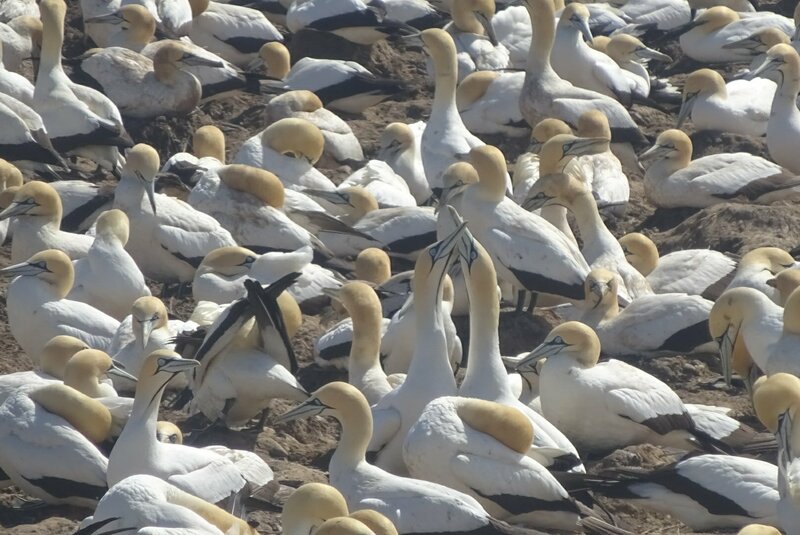 The gannets at Lamberts Bay were also good to see, nesting en masse, so that each one that flies off to fish has to circle, and warn the others before they come in to land. Beak nuzzling is all part of the couple’s bonding, apparently! 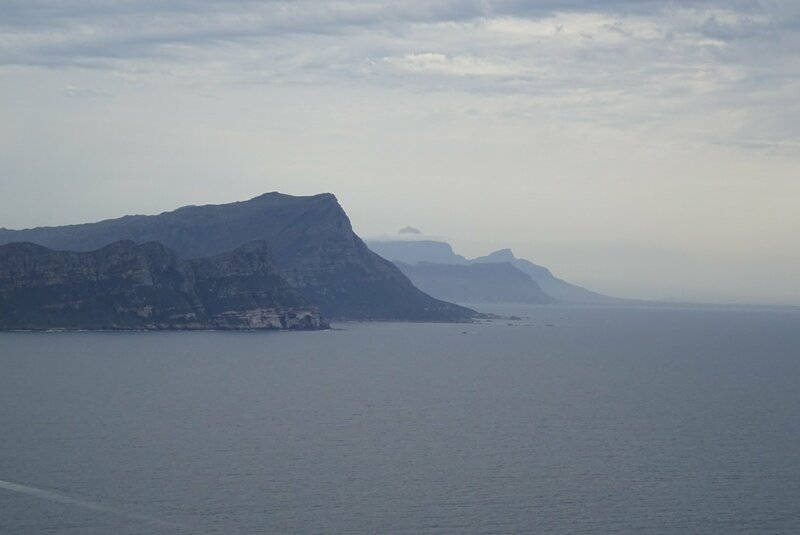 At Cape Point, we were warned repeatedly about the marauding baboons, but were disappointed that they all seemed to be hiding the day we were there. 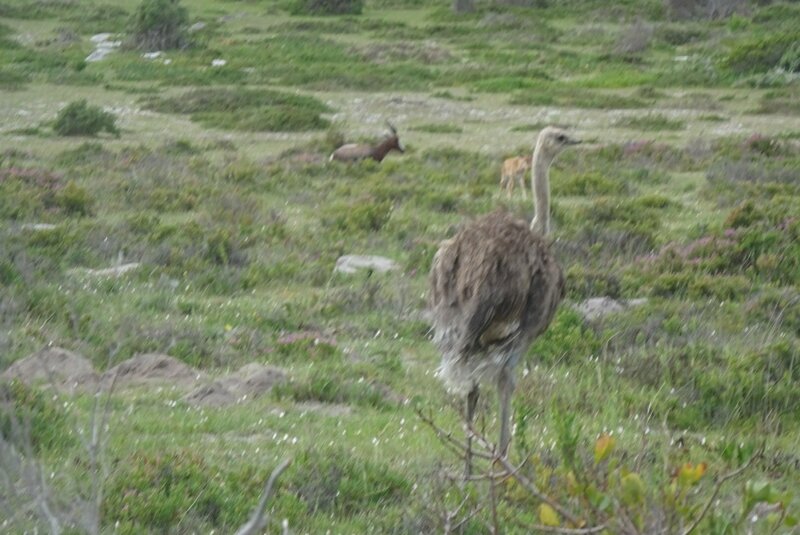 Seeing a wild ostrich and some eland made up for it though. Now for the art. Our near miss here is the new Zeitz Mocaa Gallery (Museum of Contemporary Art Africa) in Cape Town, which is opening … this weekend, just in time for us leaving the country! We did walk past it while in Cape Town, getting ready for its press opening, and the architecture looks amazing. It is created out of a huge old silo building by the Waterfront, the galleries carved out of the tubular structures. Another reason to come back again. 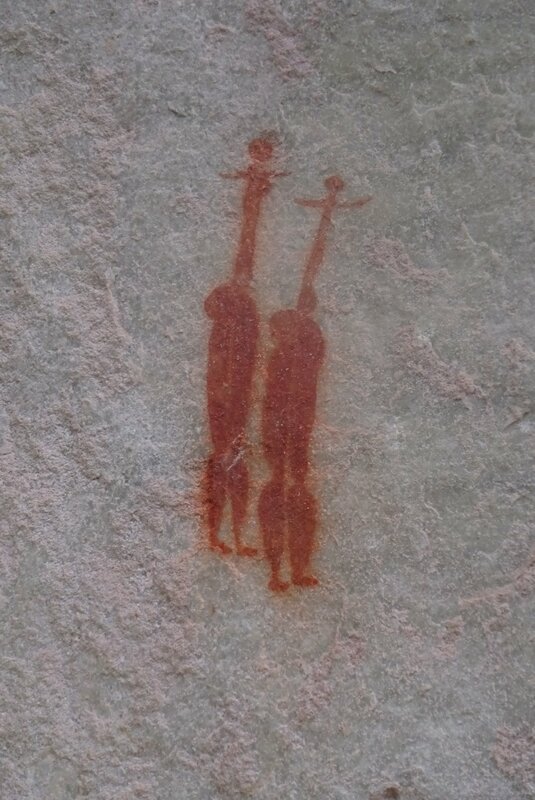 The oldest art we have seen is rock art by the San people, which we saw at Cederberg, at the Sevilla Rock Art Trail. This varies in age (in fact nobody seems too sure about its exact age) from a couple of thousand years to a few hundred, and looks so fresh and vibrant. 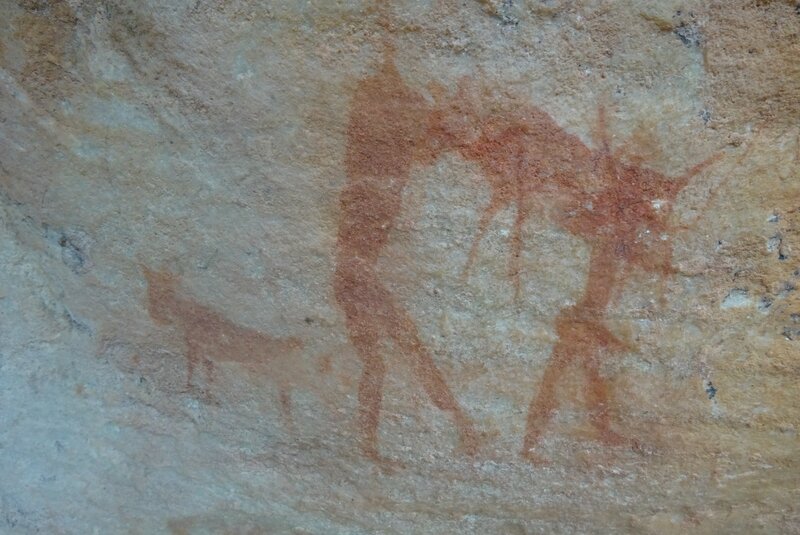 The setting helps, as you walk around the 5Km trail, looking at 9 different sites, and keep spotting more paintings in caves and rocks. When we were there, it was quiet, so at each site we were the only people there, and with no barrier between you and these paintings, you can imagine the artists all those years ago in that same spot. The drawback to this is that there is no supervision, and nothing to stop anyone damaging the art – anything like this in Europe would be roped off and under close scrutiny! 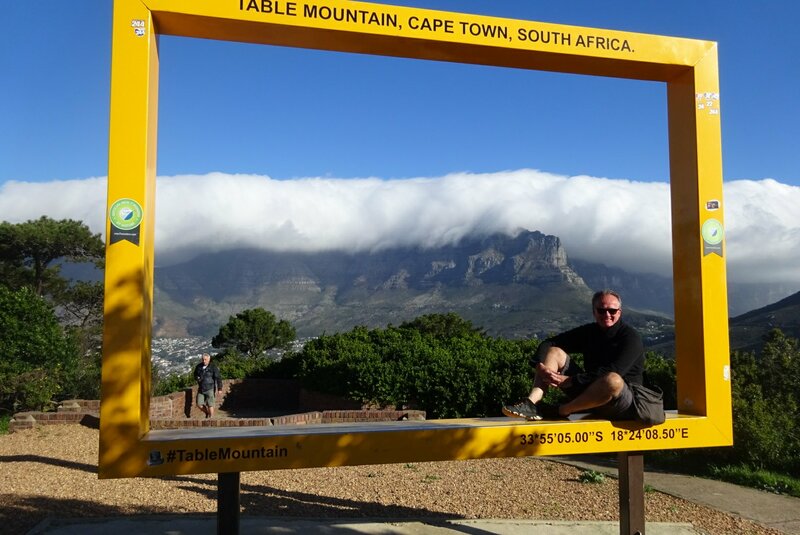 In Cape Town, the Mocaa might not have been open, but we did go to the South African National Gallery. 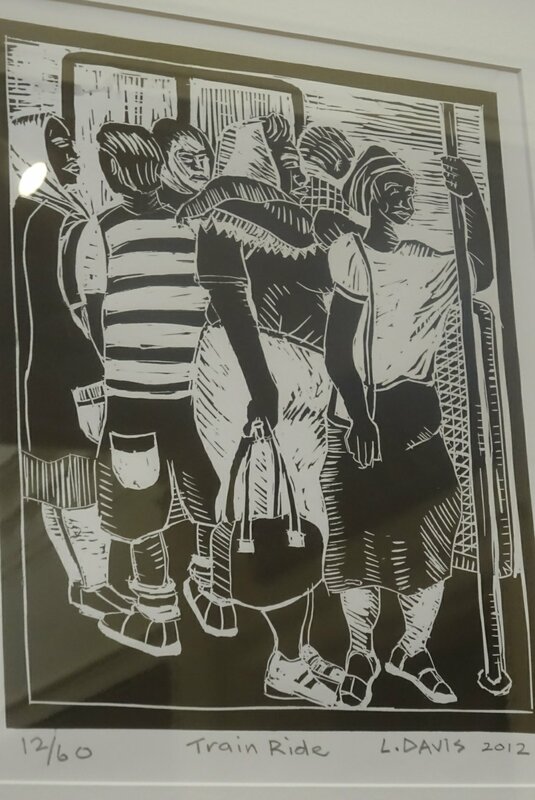 As well as art from their permanent collection, from all parts of Africa, there was an exhibition of Lionel Davis prints and paintings. 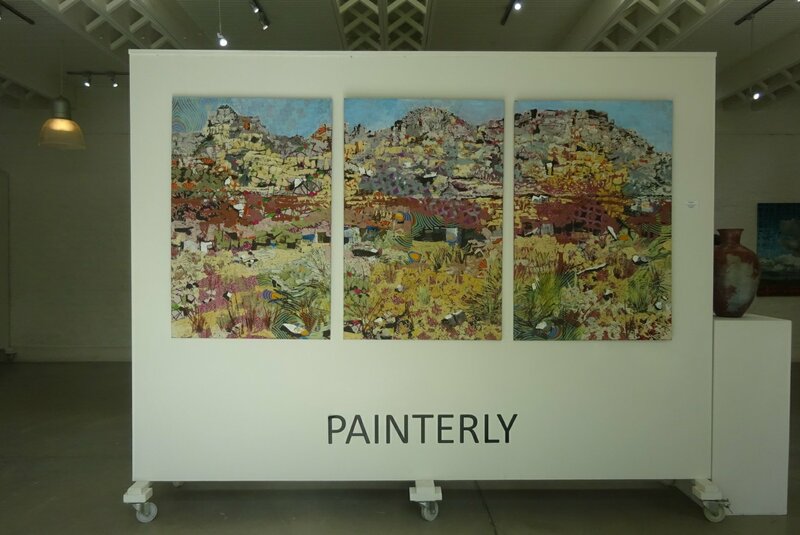 He is a South African artist, imprisoned for years as an anti-apartheid activist, who took up art later in life, and used it to portray the changes in his country, and also keep alive memories of District 6 (the area of Cape Town which was forcibly cleared of 60,000 or so inhabitants in the 1970s under apartheid rule). An artist I had never heard of, but found fascinating and inspiring. 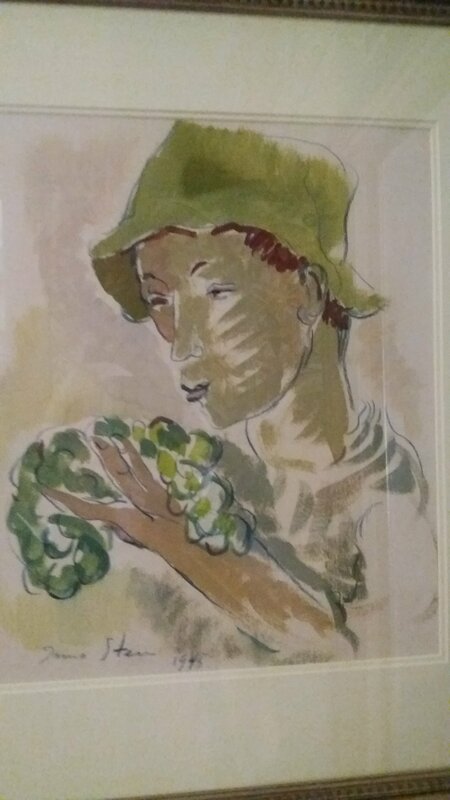 We also went to the Irma Stern Museum. 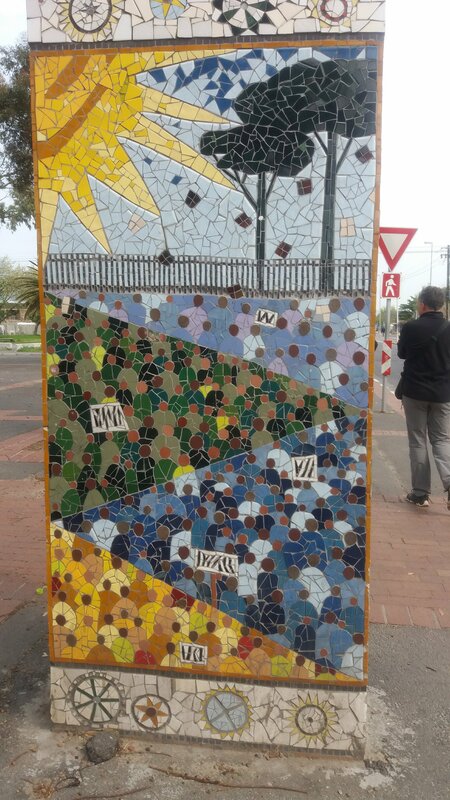 While it was interesting to see the house where this South African artist lived and worked, along with her collection of weird and wonderful art objects, we will mostly remember this place because of the lecture on J.S.Bach and his relatives which we accidentally ended up attending. The lady who welcomed us to the museum was so pleased we had come, that it seemed rude too tell her we only wanted to visit the museum, so we spent an hour listening to a music academic who knew his stuff, and then had a free glass of wine! 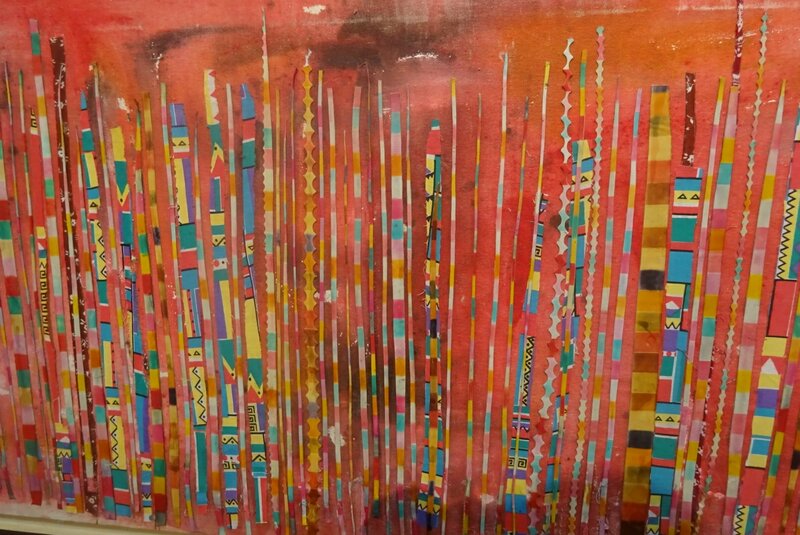 … and an art gallery in one of the vineyards on our wine tasting jaunt around Franschhoek.